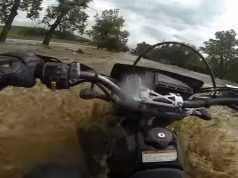 The Washington County Sheriff’s Office announced Friday that it will provide an Off Highway Vehicle (ATV) education course beginning with the first certification class at 9:00AM on Saturday, June 30, 2012 at 750 South 5300 West in Hurricane. Southern Utah has long been known for its outdoor recreation. Many locals and tourists enjoy exploring the area on ATVs. 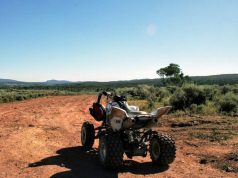 What many people are not aware of is that children under the age of eight are prohibited from operating ATVs on public lands in Utah. Any person over the age of eight who wishes to do so is required to have a valid OHV Safety Certificate or drivers license in their immediate possession. Through cooperation with the Division of Utah State Parks and Recreation we have been able to develop a course to issue state required OHV safety certificates locally. Instructors throughout Utah taught a course provided by each instructor certified with the Utah Division of State Parks and Recreation. This option has been phased out. Students are still able to obtain an OHV Safety Certificate through an online course by going to State Parks Education. This course is designed to give riders the basic skills necessary to safely operate an OHV. Some of the topics included are ATV nomenclature, ATV laws in Utah, proper safety equipment, riding technique and more. Upon conclusion of the course, students are given a written test on the material covered during the course. By successfully passing the test, each student will receive a valid OHV Safety Certificate sent from the State of Utah. Many students who are granted OHV Safety Certificates have very little riding experience. During the skill course, students bring their own ATV and are allowed to practice the techniques taught during the classroom portion. Topics include conducting a pre-ride inspection of the machine, starting, stopping, turning, climbing and descending hills, avoiding or crossing obstacles and more. The class is limited to ten students per session for safety reasons and is taught by a certified OHV instructor. Students wishing to attend the skills portion may send an email to OHV@washeriff.net which must include the students name and contact information. Each will be contacted for the next available course. The Sheriff’s Office is presenting the first certification course on June 30th 2012 at the Washington County Sheriffs Office at 9:00AM. There are no associated costs to students. However, class size is limited. Those wishing to attend the course should send a request to OHV@washeriff.net or contact the Sheriff’s Office directly. All students accepted will receive a confirmation via letter, email or phone. Students unable to attend due to class size will be contacted for the next available course. ATV Suspension Unleashed: An Easy Guide to Precisely Setting Up Your Suspension.